Roadmunk is a web application where you can quickly prepare and share beautiful product roadmaps. Manage a single set of data to generate multiple versions and visualizations, with ability to publish to URL, PowerPoint, PDF, HTML and PNG. Create stunning visualizations by applying designer or newly created palettes to your roadmap and give the deepest impact to your audience. Stay in control and collaborate by adding team members via the permission dialogue. You can make them either an editor or owner of the roadmap. We understand the product managers the creators of roadmaps are time constrained. Therefore, we've put an extraordinary amount of energy into our user experience and UI to make sure everything can be done with quickly with ease and simplicity. 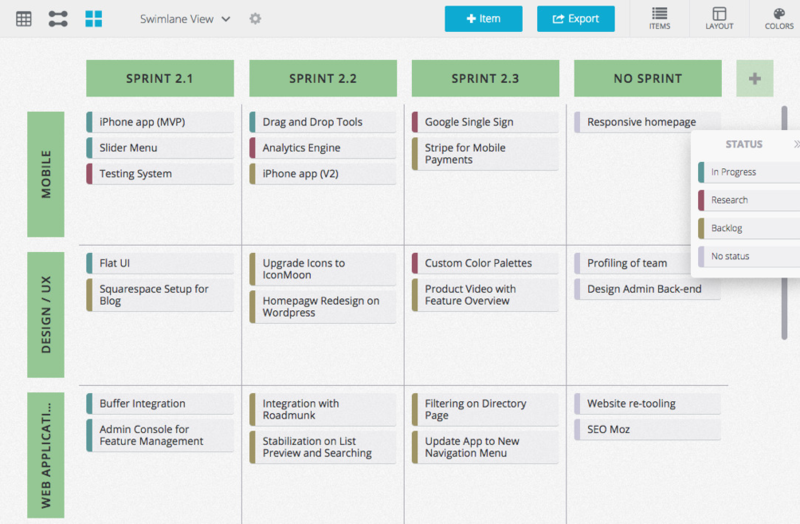 Roadmaps should look great. Moving pixels around on a slide decks is not a fun task. With Roadmunk, we handle all the design details and let you focus on the getting your content on the roadmap in an insightful way. As the name implies, a roadmap helps your organization see the future of a product or service. They're useful to keep everyone within the organization moving in the right direction, and can be crucial to the sales team. Roadmunk™ is a cloud-based roadmapping solution that can help you create more and better roadmaps faster. Roadmunk Builds All Sorts of Roadmaps. The roadmaps you can produce fit into three broad categories, Technology, Business, and Consulting. Roadmunk defines a Technology Roadmap as one that, "ties technical solutions to strategies inside an organization." A Business Roadmap provides the long view of your project, marketing or hiring plans. A Consulting Roadmap, on the other hand, is an overall strategic guide that is unique to each of a consultant's clients. In the rest of this article, we'll become more familiar with what Roadmunk can do and see if it could be your next roadmapping tool. Note: To allow them to release features faster, at the time of this review (mid-August, 2016), Roadmunk only supported Google Chrome. If your organization has standardized on a different web browser, you may not be able to go with the Roadmunk solution. Roadmap Templates. The Roadmunk Support pages include a nice selection of roadmap templates you can use to get your projects roadmapped faster. Each type of template includes a description of the way that type is used, a list of key fields that you'll need to fill in, a blank starter template, and at least one example template with data. You'll want to take a look here when it is time to create a new roadmap. Reviewer Mode. With reviewer mode you can share your roadmaps without worrying about someone changing them. This is great for getting feedback from stakeholders. You have full control over Reviewer access, including the ability to upgrade them to Users. HTML Sharing. Why email files all over the place when Roadmunk lets you share your roadmaps by posting a URL. The URL will take people to a private, password-protected, hash-encrypted HTML version of the roadmap. It's sure a lot more efficient than cluttering up the place with old copies of slightly revised roadmaps. Your Own Secure Private Cloud. Normally your roadmaps are stored on Roadmunk's servers. But the Enterprise version gives you your own secure Private Cloud in the AWS (Amazon Web Services) environment. Local Storage of Roadmaps. When you use the Enterprise version of Roadmunk you can store your roadmaps locally, instead of on Roadmunk's servers or your own Private Cloud. This creates a new server instance that is only available to your Enterprise-level account and provides additional security. Insertable Milestones. Sometimes you have no choice but to pin your roadmaps to fixed dates. Indicate progress, tactical achievements, or fixed dates by adding different types of milestones (tradeshows, releases, and the like) to your roadmaps. Export to Popular Presentation Formats. You often need to deliver your roadmaps using presentation software. Roadmunk makes the easier by exporting roadmaps preformatted in 4:3, 16:9 or 16:10 aspect ratios, in PPT, PNG, or HTML formats. You won't need to waste time fiddling the roadmap to fit into your presentation software. Different Views for Different Users. As you know, different audiences require different levels of detail in roadmaps. Your project manages need to know it all, while the execs probably just want to see the big picture. With Roadmunk, you can output roadmaps with differing levels of granularity, as well as completely different formats, (timeline, table, and swimlane). You can also create your own views and pivots based on your organization's unique needs. If you have a Professional or Enterprise license, you can also roll up several individual roadmaps (called sub-roadmaps) into one high-level roadmap. Unlimited Pivots. A pivot is a way of looking at a set of data from a different perspective. Here's an example from the Roadmunk site, "pivoting a project by the project lead on the swimlane will convey different information than pivoting a project by time or a project by status." Roadmunk allows you to pivot on virtually any field. Buckets and Fuzzy Time. Sometimes you can't set a specific date for an item in a roadmap. Roadmunk uses the term "bucket" to designate a time period that doesn't correspond to an exact date. Fuzzy Time is a representation of this concept that can be displayed in swimlane view. Data Filtering. 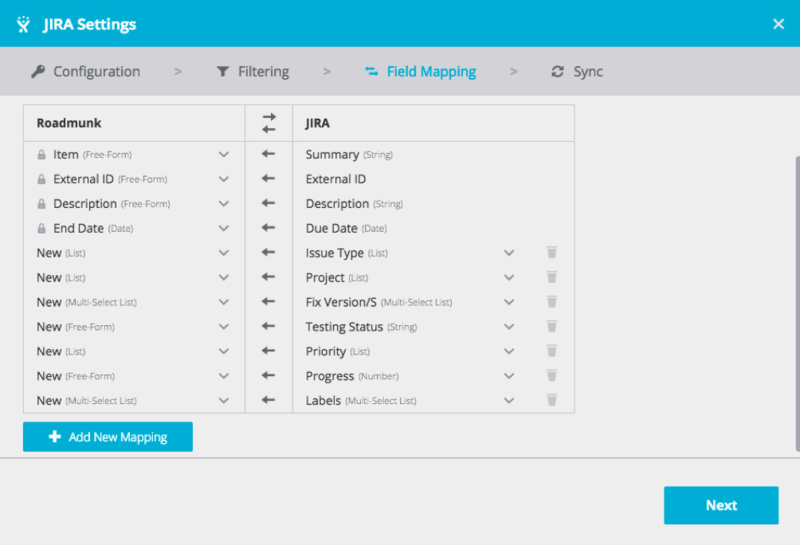 Users can apply filters to your roadmaps to see exactly the data they need. Each view has its own set of filters that make sense for that view. Customizable Color Schemes. You can subtly enhance the impact of your roadmaps by using color schemes compatible with your branding. Roadmunk gives you a set of predefined color palettes. Even better, you can define a custom palette that will be shared across all users and all roadmaps in your account. Printer-Friendly Output. If you need to publish your roadmaps on paper, you can run into problems with paper sizes. Roadmunk eliminates the issue by understanding the A4, Letter, and Legal paper sizes. It can generate printer-ready roadmaps for any of these simply by telling it which type of paper you will be printing on. Roadmap Access Control. You have complete control over which users have access to your roadmaps, as well as over what those users can do to them. The Sharing Settings option lets you assign access, and give each person Editor, Viewer, or Owner level access s appropriate. Built-in Team Collaboration. The ability for multiple people to view and comment on roadmaps allows for collaboration within Roadmunk. Reviewers and Users can comment here and a record of the conversation stays with the object so buy-in is visible and centralized. You can get the attention of specific individuals with direct @mentions, which appear as alerts in their interface. Attach Files to Roadmaps. When more detailed information is necessary for items in the roadmap, you can directly attach files to each of them. JIRA Support. Data that's relevant to creating your roadmaps often appears in your tech team's development tools. Roadmunk can synchronize with and use this data if your development tools use JIRA. This includes Hosted JIRA and Cloud JIRA (also called JIRA on Demand). Roadmunk also supports CSV format for importing data from non-JIRA products and services. The Roadmunk blog contains a collection of quality blog posts. Looking more like newsletter articles than basic blog posts, they include illustrations, links to additional information, and refer you to related articles. You can search the blog by keyword, or use one of the half-dozen categories listed at the top of the page. And you can sign up for their newsletter to have new posts and other information delivered automatically. Roadmunk offers four tiers of licensing (Starter, Business, Professional, and Enterprise), billable either monthly or yearly. As you would expect, the higher tiers offer more features and benefits, including things like larger file attachments and quicker access to customer support. The Starter tier gives you just the most basic capabilities. To put Roadmunk to work on a big project you will almost surely need to go with at least the Business tier. If you go with Business or better, you get access to features like commenting within the product, exporting and formatting to various formats and JIRA integration. From this tier on up, you can also add Reviewer seats (see Reviewer Mode earlier in this article) for $5 per reviewer per month. Whichever tier you choose, you begin your experience with Roadmunk's 14 Day Free Trial. Roadmaps are vital to most modern organizations, whether for business planning, building out technology projects, or mapping out the strategic vision for a consulting job. Roadmunk gives you a cloud-based (SaaS) service for creating and sharing roadmaps across your entire organization. Creating roadmaps is easier with Roadmunk since you can import data from other tools already in use by your teams. Publishing those roadmaps is easier with everything from HTML versions accessible through a browser, to PDFs and images, to print-ready formatting with just a few clicks. And keeping the team moving together is easier with integrated commenting and review-only modes for stakeholders who need to buy in. Assuming you are looking for a new roadmapping tool (if you aren't, why are you reading this?) you should consider giving Roadmunk's free 14 day trial a shot.